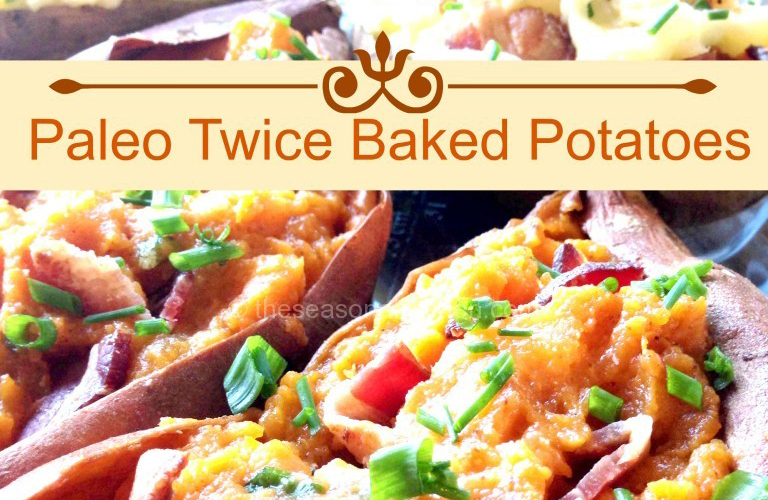 Try this new healthier version of a twice baked potato. This works great with both white potatoes and sweet potatoes. Bake the potatoes at 425 for 50 minutes or until a knife easily inserts to the center of the potato. Remove the potatoes from oven and allow them to cool 30 minutes. Reduce the oven temperature to 350. While the potatoes are cooling cook the bacon and rest on paper towel to cool then chop into chunks, set aside. Chop the scallion and set aside. Once the potatoes have cooled enough to work with them cut 2 of them in half. Gently scoop out the center of them leaving a nice shell base for stuffing. Place the scooped potato filling in a bowl. Peel the third potato and add that baked potato to the bowl of potato filling. Add the egg, ghee, chopped scallions and a pinch of salt to the potato filling and mix well. Add the mixture back into the 4 potato shell halves. Bake in the oven at 350 for 18-24 minutes until set. Enjoy!